The Big Island of Hawaii is the residence of Péle, the mythical and powerful volcano goddess. 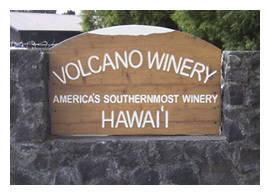 It is also the home of one of the world's most exotic wineries, appropriately named "Volcano Winery". Located at 4000 feet above the sea level, between two of the most active volcanoes on the island, Mauna Loa and Kilauea, Volcano Winery is a delightful stop for tourists and locals alike. Volcano Winery is a family-owned business. Lynn McKinney, a retired veterinarian from the neighbouring island of Oahu, established the winery in 1986. The winery first opened its doors to the public in 1993, with a selection of fruit and grape blended wine. The winery was sold in 1999 to wine aficionado Del Bothof. Today, under the management of Bothof's son, Scott, the winery has found a niche in offering wine with a Hawaiian flair. As Suzanne Stout, Volcano Winery's marketing manager, points out: "Our wine is really unique. We are not trying to compete with more traditional wineries you may find on the mainland such as those in Napa Valley or New York. Our niche is tropical fruit wine and macadamia-nut honey wine." Volcano Winery produces three distinct types of wine: from grapes; from a blend of grapes and locally grown fruits; and from the honey of macadamia-nut blossoms. The traditional style wine is made from the Symphony grape, a cross of Grenache Gris and Muscat d'Alexandria, developed in the labs of UC at Davis. It is found to be a very suitable grape variety for the hot and wet climate. Wine made with Symphony grapes comes both dry and off-dry, possessing lychee, peach and apricot nuances. Both versions were medal winners at the 2004 Finger Lakes International Wine Competition in New York. The grape and tropical fruit blended wines are truly exotic. They are made with French Colombard, Carignan, and Jaboticaba berries. The former two are not cultivated on the island. In fact, they are imported from California as grape juice, then blended with local fruit. Jaboticaba, a.k.a. Brazilian Grape Tree, is grown locally. The berries harvested from the branches of this tree give the wine a distinct cherry-cranberry flavour. Volcano Red, or "Péle's Delight," and Volcano Blush are both blends of Jaboticaba berry and various proportions of French Colombard and/or Carignan. Another medal winner is the slightly sweet Hawaiian Guava Wine, made with yellow guava and French Colombard. My favourite wine of all is the winery's signature dessert wine, made with 100% macadamia-nut honey. It is exquisite and feather light -- an elixir for the goddess! 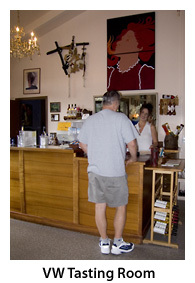 Volcano Winery is open 365 days a year, offering free wine tasting from 10:00 a.m. to 5:30 p.m. 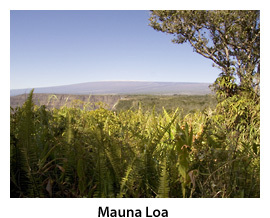 It is a convenient side trip before or after a visit to the Hawaii Volcanoes National Park. 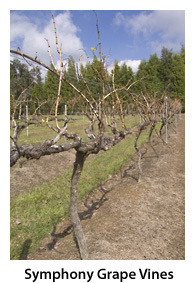 For more information about the winery and its product, visit www.volcanowinery.com. Copyright © 2005 Chiya Li. All rights reserved.